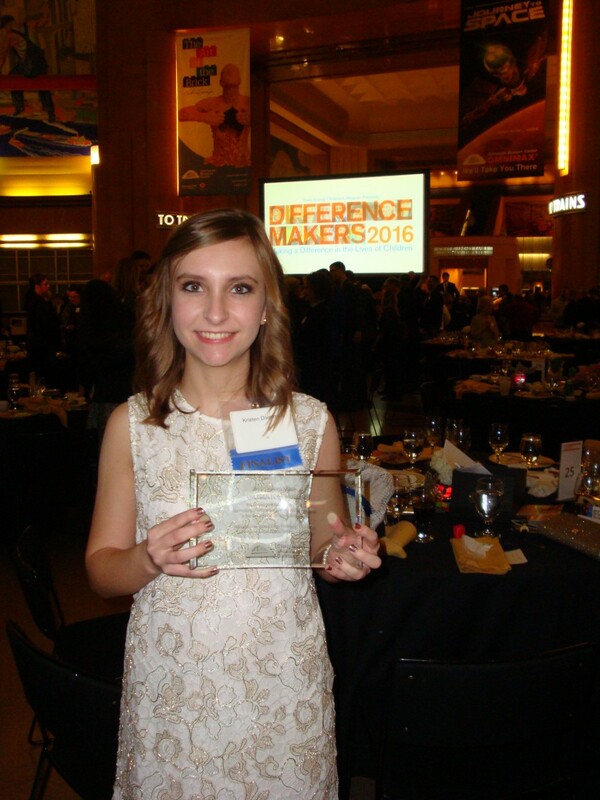 On Saturday, February 6, “Children for Change” was named as the Honoree in the School/Youth group for the 2016 Duke Energy Difference Maker Award during a ceremony at Duke Energy Children’s Museum. “Children for Change” was founded by Milford senior Kristen Dalrymple. Duke Energy Children's Museum's Difference Makers Celebration honors youth, adults, businesses and agencies that share our focus to better the lives of children in our community. Difference Makers go out of their way to enact significant change in the community and distinguish themselves from others by their dedication and impact. A group of community members and business owners came together to judge this year's finalists. “Children for Change” empowers high school students to be mentors for elementary school students, teaching them how to be future leaders of their community. Through a combination of volunteering and on-site training at Milford elementary schools, “Children for Change” has demonstrated the importance of being a vehicle for change in their community. Students involved have worked with several organizations around the region, including Over-the-Rhine Senior Center, Joseph House and SEM Haven Nursing Home. “I have learned so much from the students who have participated in this program! They are so caring and respectful. They also have so many original and creative ideas about how to help others,” Kristen said. Kristen developed her passion for Service while attending the Mayerson Summer Service-Learning Camp in June of 2014. “Children for Change” was born shortly after this camp. Kristen has also been supported by Youth Serve America (YSA), who is helping her develop “Children for Change” into a non-profit organization. YSA named her as the Ohio Youth Awareness Ambassador and gave her a grant for $1,000 and an all-expense paid leadership training in Washington, D.C. to support her program. “I was inspired to start Children for Change after seeing a need in our community for volunteers. I wanted to teach students how to be leaders in their school and community by doing selfless good deeds for others. I wanted to teach students in elementary school so that students could find a passion for volunteering that can last a lifetime,” Kristen said. “I would like to thank Mr. Wahl and Mrs. Schunk for inspiring me to start Children for Change and for their support through the process of creating this program. I would also like to thank the Mayerson Foundation and Youth Service America for providing me with the support and tools to make this program successful. I would also like to thank my mom and sister for supporting me through the creation of this program,” Kristen said. Learn more about Children for Change by following them on their Facebook page "Children for Change" and Twitter page @c4cmilford.